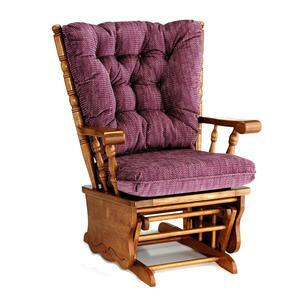 Take a seat and a glide in this comforting swivel gliding rocker chair. A deeply tufted back provides you with comfortable support and the ultimate in relaxation. The soothing motion of the gliding base puts your body and mind at ease and is sure to help you let go of stress. 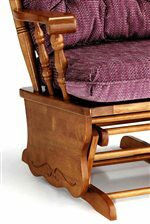 Turned spindles and an exposed wood arm create a classic look that is casual and relaxed, while a carved detail on the base adds a touch of charm to this swiveling glider rocker. The swiveling base allows you to turn in all directions as well as glide, providing you with even greater flexibility and range of motion. Available in a beautiful Golden Pecan wood finish and over seven hundred fabric choices, this gliding chair can be customized to create a look that is truly unique that you are sure to love. 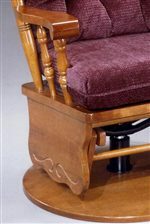 The Jive Swivel Gliding Rocker Chair by Best Home Furnishings at Baer's Furniture in the Ft. Lauderdale, Ft. Myers, Orlando, Naples, Miami, Florida area. Product availability may vary. Contact us for the most current availability on this product. Seat Support Sinuous wire springs are cross-wired to prevent sagging. Spring clips are goated with polypropylene to prevent squeaks. A mother cradling her newborn, the quiet back-and-forth motion lulling him to sleep, or a grandmother reading a favorite childhood book to an eager toddler. These are the serene moments that gliding rocker chairs are made for. These gliding rockers provide the ultimate in quality bearings and exceptional engineering to produce the longest, smoothest glide in the business. A tufted back with premium cushioning fibers provide unparalleled comfort and durability, allowing you to find a sense of deep relaxation and to embrace the soothing gliding motion of these rockers. If you're looking to create your own tradition of tranquil moments, then look no further than this collection of gliding rocker chairs and ottomans to find the familiar 'float on waves' feeling that you remember from your own childhood. This collection is available in a warm Golden Pecan finish and a rich Victorian Cherry finish. These beautiful finish options can be paired with your choice of over 700 fabrics to create a look that is truly unique and completely you. A lock glide rocker base and a swivel glide rocker base are also available to provide you with even more versatile motion and function. Take a glide in this rocker because the quality and comfort is sure to win you over. The Jive collection is a great option if you are looking for Casual furniture in the Ft. Lauderdale, Ft. Myers, Orlando, Naples, Miami, Florida area. Browse other items in the Jive collection from Baer's Furniture in the Ft. Lauderdale, Ft. Myers, Orlando, Naples, Miami, Florida area.